For anyone who has been in any kind of contact with me these last few months, you will be aware that at the end of April this year, marked exactly 100 years since our arduous, tenacious and fabulous suffrage sisters from 12 different countries marched on The Hague. More than 1000 women achieved this journey, in those times a100 years ago for women to do this journey would be a challenge at the best of times, but this was during war times too. If you like you’re history, here’s a video demonstrating the journey taken by UK sisters in 1915. Many blocks were put in their way, many excuses were set by governments, but they got there and then founded the Women’s International League for Peace and Freedom; affectionately known as WILPH who now consists of sections in 33 countries, with the newly joined; Cameroon, Ghana & Israel. Here’s a very brief video capturing some of us at this year’s Centenary from Congress to Conference and celebration One of our founders, a Dutch Suffrage sister; Aletta Jacobs had a bronze statue placed at the Peace Palace and is one of the first women peacemakers to be honoured in this way. At WILPF’s Centenary in the Hague we heard of many celebrations but also of personal journeys of individuals over coming abuse and oppression. One of our sisters stood up and told of her current position, “…I hadn’t realised that at the point of coming to the Hague to celebrate WILPF’s Centenary, that I would be doing so as a refugee…” Amal is from the Yemen and currently cannot return home, boarders are closed. In good WILPF tradition a letter was drafted to be hand delivered to all Embassy’s in the Hague. Clare and Caroline of UK WILPF Leicester Branch headed off to the British Embassy in The Hague to call for the end to military action in the Yemen. 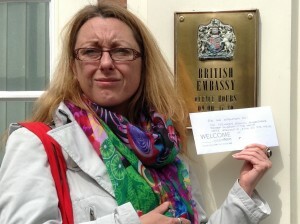 Caroline and myself; of UK WILPF Leicester Branch, responded immediately to the request from Sameena Nazir for volunteers to hand deliver each of these letters to each of the Embassy’s. 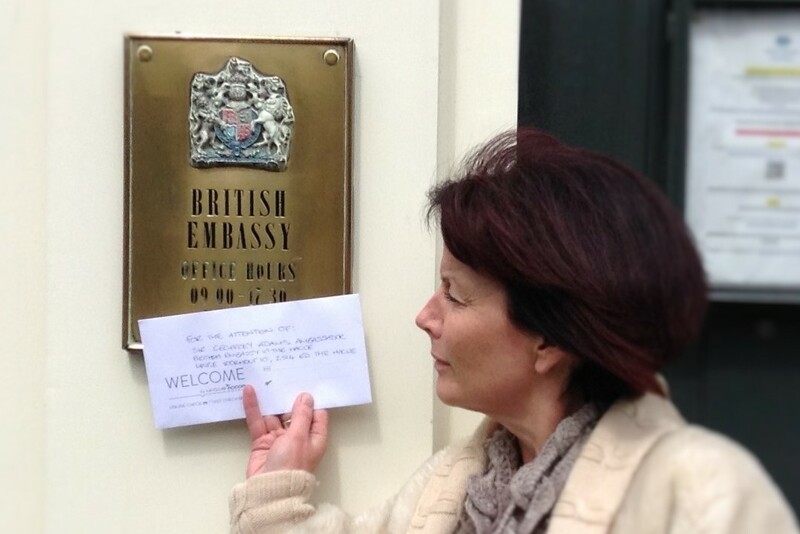 Caroline and I took a taxi to the British Embassy with letter gripped in hand anticipating handing the letter over to Sir Geoffrey Adams we buzzed the intercom. A voice informed us that the Ambassador was not in the building that day. I requested someone to come to the door to receive the letter in the agreement that it would be handed to Sir Geoffrey Adams at the earliest opportunity. Sadly, the voice on the intercom informed us that there had been a fire recently, other than himself nobody else was there and it was a none-working Embassy. Further informing us that we could put the letter in the post where it would be redirected. A somewhat deflating outcome, but hopefully the letter will have been received and responded to by time of writing this. For more information about the Centenary; Congress or Conference and to learn more about WILPF and whether you would like to get involved, please see below… or see Clare’s photos from the Hague on Facebook. If you would like to learn more, google WILPF wherever in the world you are and find a Branch you can get to. If you are in the Midlands Leicester Branch is your place, if you would like to join us contact me for details. With our 10 Congress Resolutions adopted – we’ve got plenty of work to do! Together, we, can make a difference. Read WILPF-2015-Manifesto Adopted April 2015 in The Hague, where WILPF was founded 100 years ago.